Do you pull out the same holiday decorations year after year, putting up the same tree and decorating the mantel in exactly the same way? Do you ever feel like you’d like to upgrade your holiday decorating game? 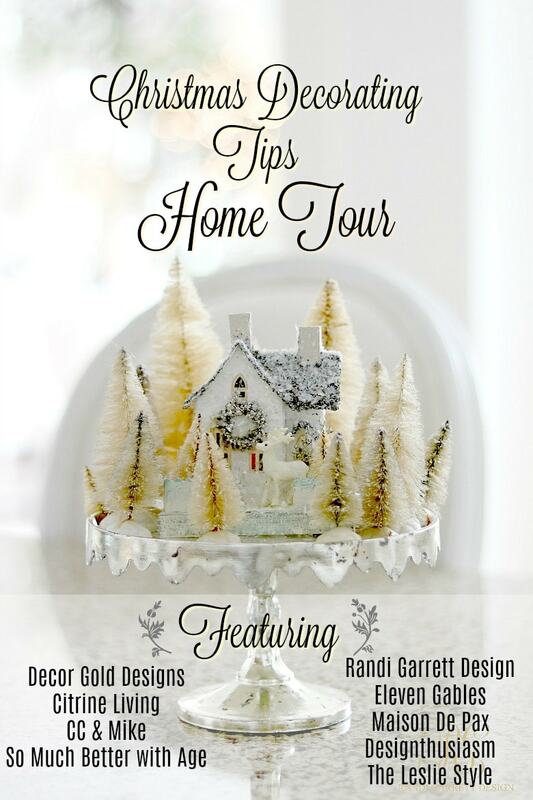 Today I’m joining with several other bloggers for a blog hop hosted by my friends Randi from Randi Garrett Design and Jen from Decor Gold Designs. 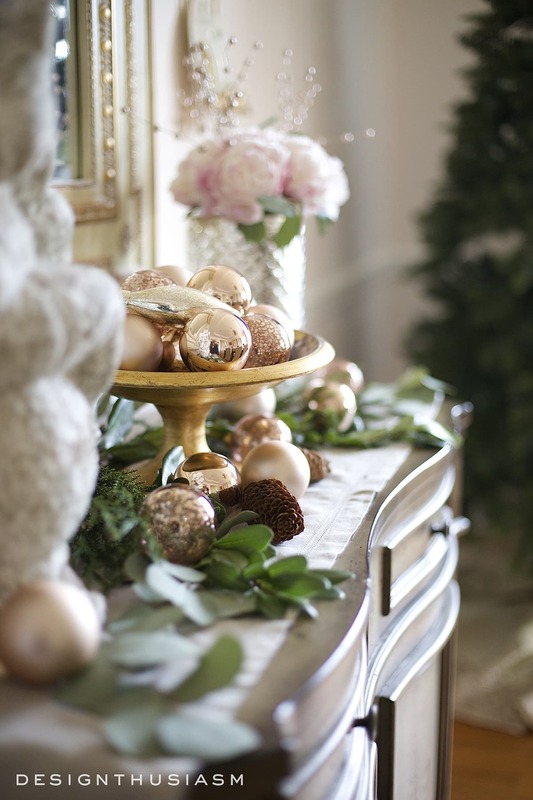 We’re bringing to you our top tips for styling your home for Christmas. 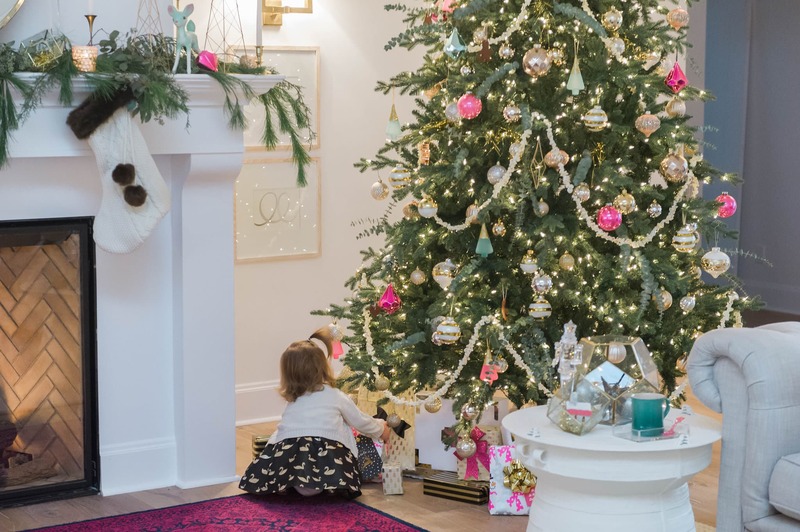 If you’re coming over from Rachel’s beautiful home at Maison de Pax, I’d like to welcome you and share with you my 10 tips for making your holiday decorations more special. 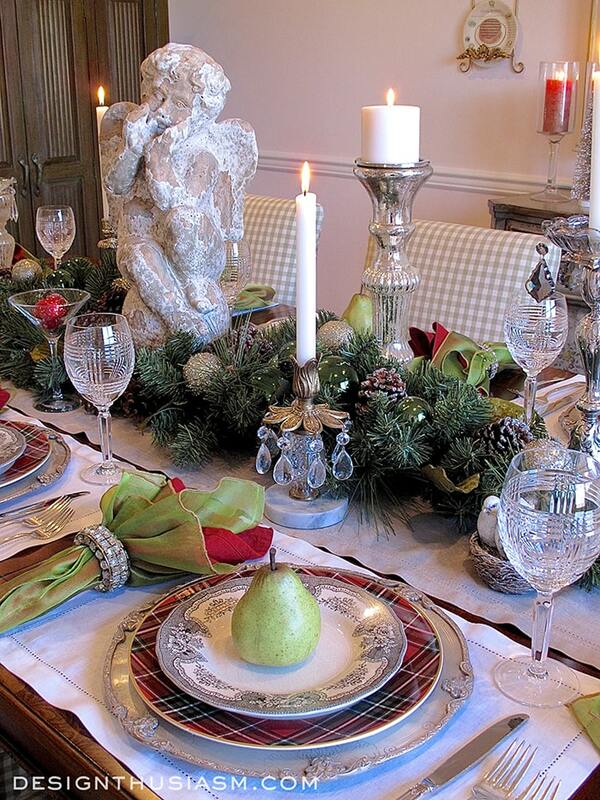 A classic way to decorate for Christmas is by using varieties of winter greenery. Trees, wreaths, garlands and the like are all displayed in many homes. But don’t underestimate the power of an actual floral arrangement. It’s one step more special and will elevate the decor in any corner of your home. 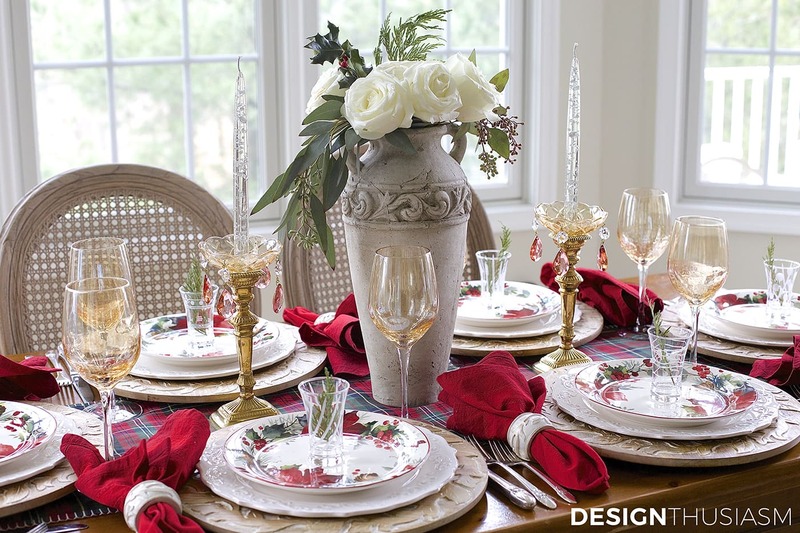 Long gone are the days when red and green was the only color combination for holiday decor. 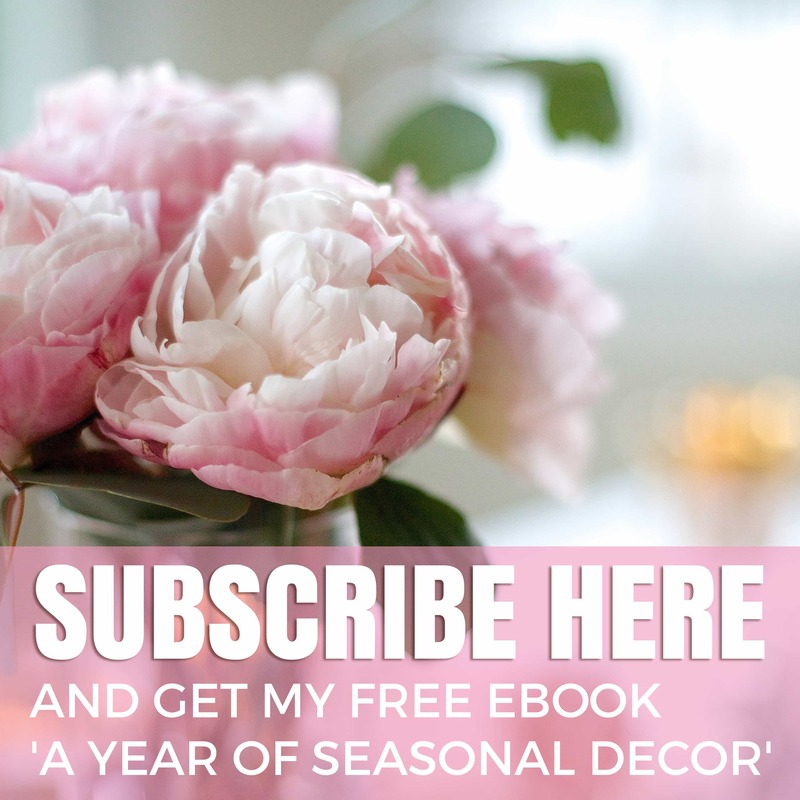 One of the first choices you should make before beginning your seasonal decorating is narrowing in on a color feeling. Last year I chose rose gold and my various rooms used different applications of this theme, sometimes mixing pink with gold, and other times focusing on a warm toned burnished gold. You might choose white, or blues and greens. 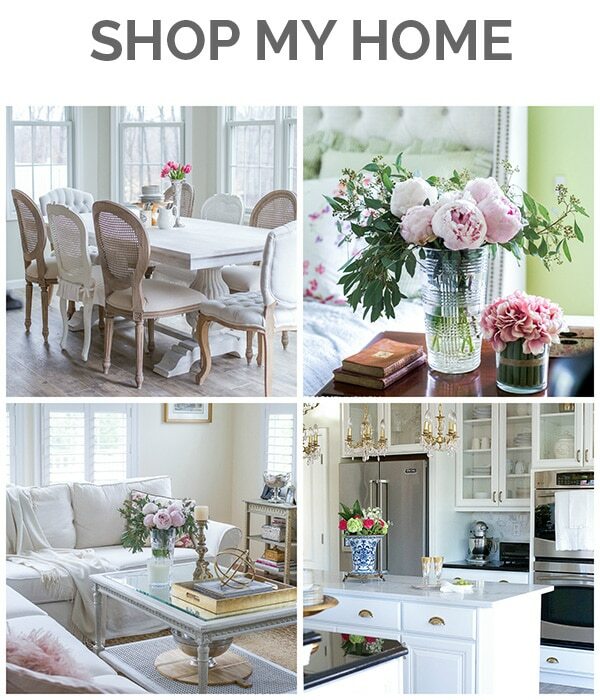 But whatever you select, you home will look most cohesive if carry the palette loosely throughout. You can see more of how I used these colors by clicking on the photos below. There are certain patterns that say Christmas to me and tartans are surely at the top of the list. But to make them just a bit more sophisticated, mix them with something soft and feminine. Florals, lace borders, animal print or even tweed, will take your plaids to a higher level and add interest to your holiday rooms. I always prefer fresh flowers but in winter sometimes they’re simply not practical. Many people use faux greens and dress them up with fresh flowers, but you can also do the reverse, as seen below. 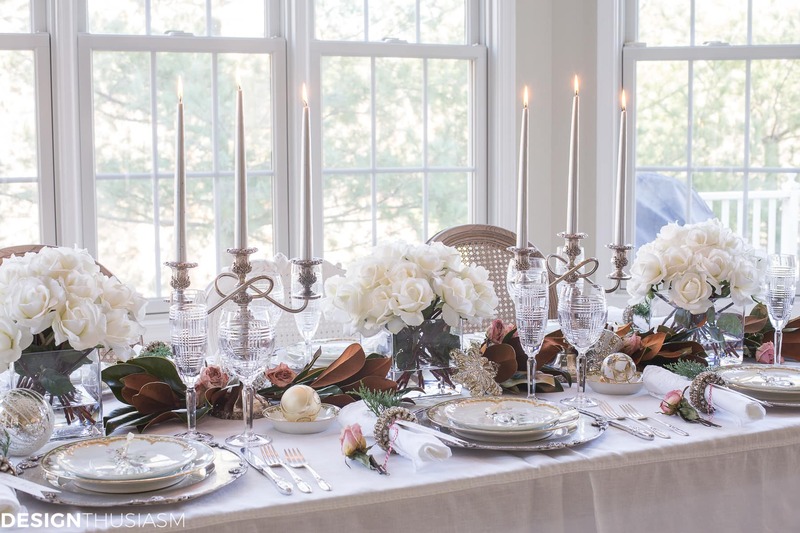 These fresh magnolia leaves are mixed with ‘real-touch’ faux white roses, as well as scattered dried blooms. I try to make sure there’s always something fresh and live in the mix. 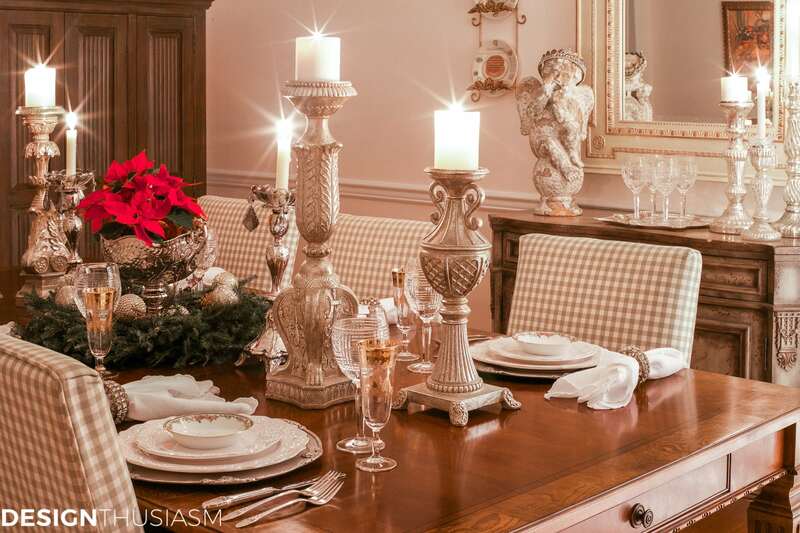 I love to use shine and glimmer at holiday time and pulling out vintage pieces can help with that effort. 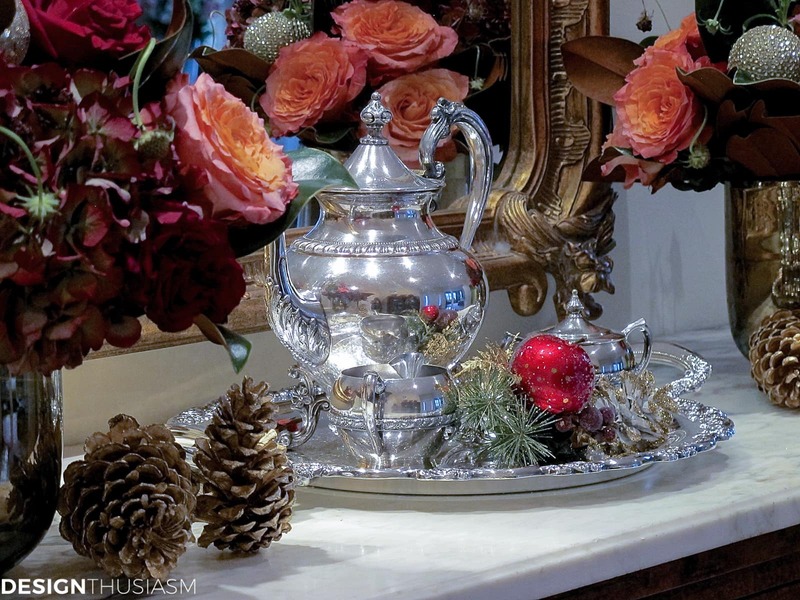 Silver objects, gilding or crystal items keep things looking upscale and quite refined. 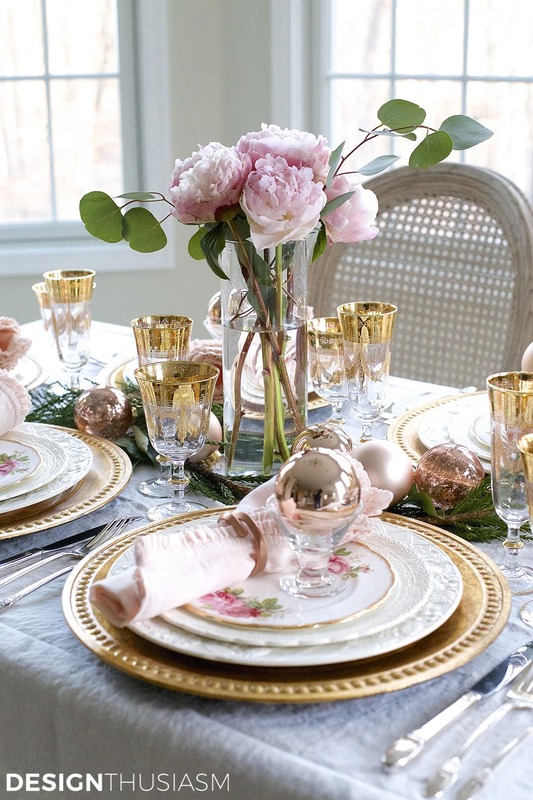 Toss a glittered bauble here and there to further amp up the glam. We’re all familiar with the standard holiday imagery, but to personalize your spaces, it can be really nice to add your unique passions or collections into your decor. 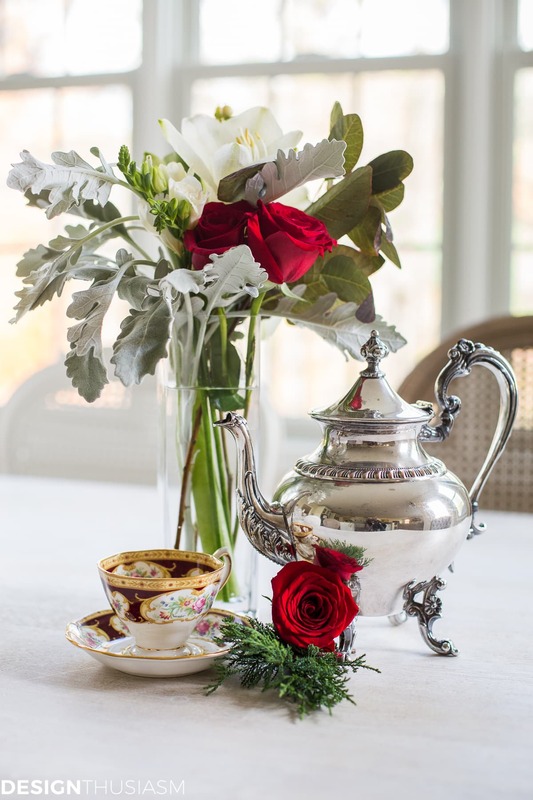 I’ve been collecting vintage teacups for many years and they look wonderful wired to my holiday tree. 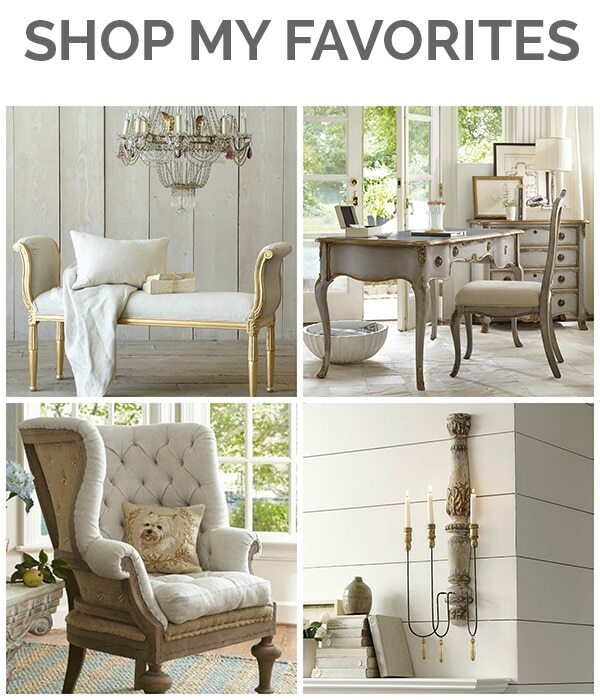 Whatever your individual interests are, see if you can find a way to add them into your decor. If your tree looks like something you’ve never seen in a display window, you’re doing it right! Sure, we all love to use holiday lights, but how much more special is real candlelight? I’m a huge candle fan and the more the merrier. In varied heights, using pillars and tapers, and even votives spread around a room. 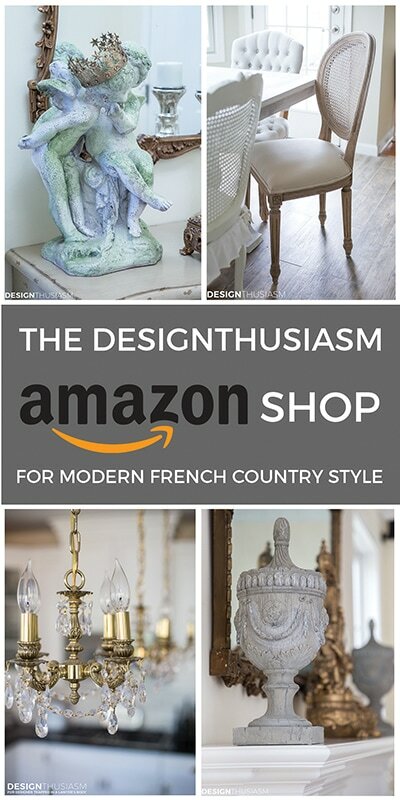 It’s a wonderful opportunity to bring out your finest candlesticks and it adds to the magic of your room decor. Of course we all make bold statements with trees and mantels, but sometimes it’s nice to add sweet little vignettes in surprising places that are often ignored. 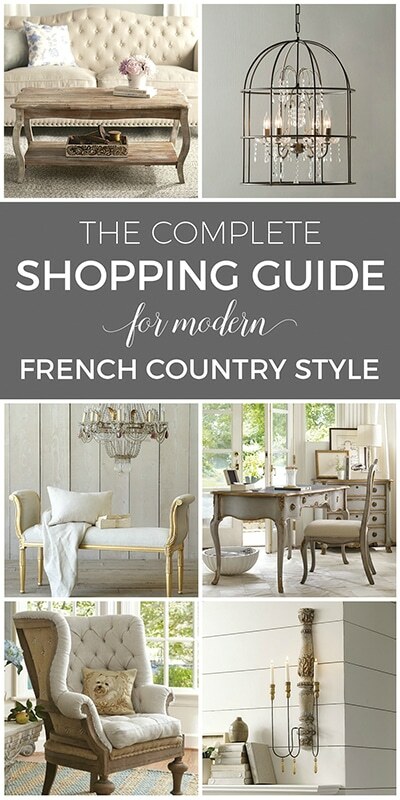 A writing desk, a bathroom table, a kitchen counter or other little corner. Pine cones and berries on the bedside table. Sprigs of greenery tucked into a shelf unit. This added cheer sprinkled about can really uplift your holiday mood. As the weather chills, it’s fun to add cozy blankets and throws and Christmas is the perfect time to fit these comforts into your decor. 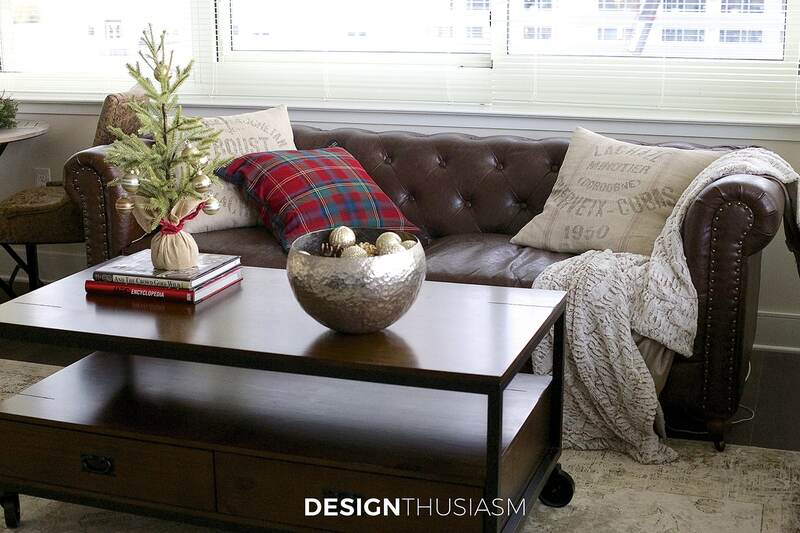 Fur throws, wool pillows, burlap details and other winter cues. How nice is it to nestle into a cozy couch and curl up in a toasty blanket? 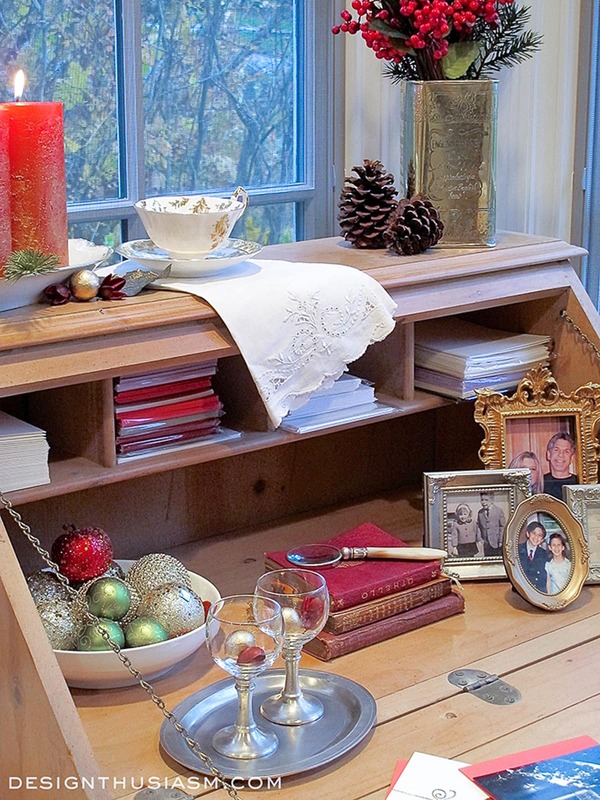 No matter how small or temporary your living quarters, there’s always room for festive decor. 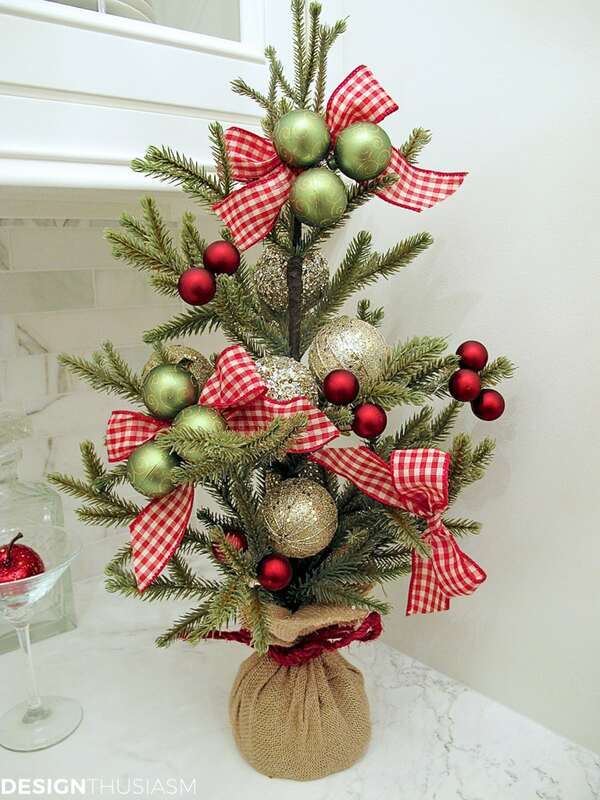 A tabletop tree can brighten your space or tuck one into one of your overlooked spaces. This one below is in my tiny butler’s pantry, or sometimes we keep it on the stairway landing. 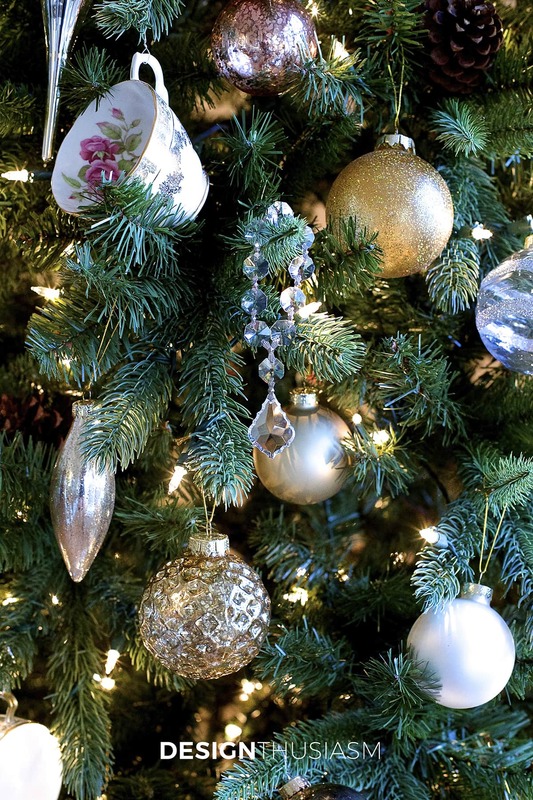 I hope you found inspiration in these tips for upgrading your holiday decorations. The more you personalize your spaces and think outside the box, the more your holiday decor will continue to delight you. 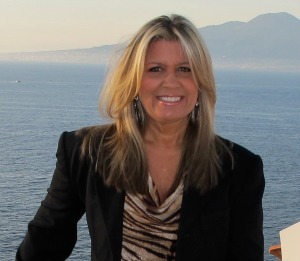 Next on the tour is The Leslie Style, and I know you will love both her fabulous style and amazing tips! You can also see the full line up below and enjoy the other posts from my blogging friends. Their wonderful ideas are on my list for next year! Thanks Lory, for the great tips and resource sharing. I really enjoyed looking back at previous years Decor colors and ideas! Also caught a glimpse of the handsome devil you’re married to, in a photo on the desk! Lory I absolutely love your tips, they are perfect for the holidays! One thing I need to start doing is pulling out my silver – I am horrible at polishing it so I rarely use it…but it truly makes everything so much more refined! Thank you for the reminder! Your style is so elegant and I love your details! Such great tips, Lory! I love your teacup in the Christmas tree. Gorgeous! And great tips. I already try to use most of these in my decorating. The pink and gold setting is one I haven’t tried yet though. Maybe in another year.